Shankar Mahadevan – A legend in making? Shankar Mahadevan is one of the best singer and music director we have in the industry. May it be classical or the traditional bollywood songs, Shankar’s voice has never failed to create the magic.. He may not have gotten his dues during the initial stages of his career, but now Shankar is known to all and is being loved by all.. But, he still is an underrated singer.. He is one to have mastered breathe control and his emotions make the listeners move into the song. May it be ganesh vandana, peppy numbers like jhoom barabar jhoom, songs with full on emotion like Maa from Taare Zameen par or the semi-classical songs, Shankar Mahadevan has always given his best in whatever he does.. Currently he is seen giving tips to contestants in the musical reality show – Saregamapa Challenge 2009..
Shankar, nicknamed as Iceburg by his wife, was born in Chembur, Mumbai on March 3rd.. He learned Indian Classical Music and Carnatic music in his childhood. He started playing Veena at the age of 5 and his first solo performance was at the age of 11. He was mentored by Guru T.R. Balamani and was trained by Tara Devi who took care of his North Indian semi-classical learning. He did bhav-geet with Srinivas Khale, the legendary Marathi composer. Having been worked for Oracle Corporation for 9 months and a software engineer by profession, Shankar has always had a passion for music. This passion made him to venture into this field of music and he got his first bollywood playback singing assignment in 1995 for Akele Hum Akele Tum.. After teaming up with Ehsaan and Loy, Shankar composed tunes for many hit albums and Ad jingles. He does not only sing for his own tunes, but is also a hot favorite for other music directors.. He gained immense fame with his album breathless and Nine.. He is a part of a Swedish band called Mynta, whereby he travels to perform twice a year. Also performing in the Chineese Jazz festival , he considers quite important to him. He is a national award winner who shared the award with Ehsaan and Loy for best music director in Kal Ho Na Ho. He has also received a solo award for Best singer in Tamil Movie, Kandukonden Kandukonden. Shankar has not only ventured himself into bollywood, but has also been part of various other fusion album and ghazals. 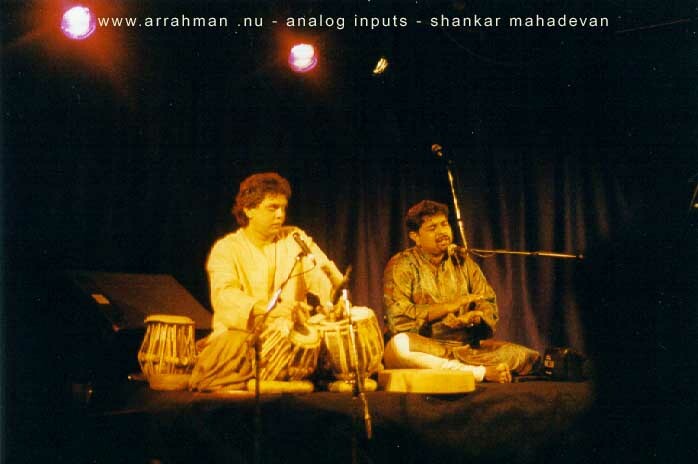 Among Western musicians, Shankar has grown up with Pink Floyd, Stevie Wonder, Bobby McFerin and Weather Report. Also a lot of Indo-Jazz with Louis Banks, and currently is a part of his band. Shankar Mahadevan has also provided vocals for several compositions of Remember Shakti which features maestros like Zakir Hussain, John Mclaughlin, U. Srinivas and Selvaganesh Vinayakram. After knowing all these facts, he definitely can be called a legend in making.. There are very few musicians who have ventured themselves into a wide range and Shankar is one of them.. Classical, ghazals, indipop, fusion, bollywood – he is there every where yet very much underrated.. Very Informative post!! .. Keep on rocking! when will u post more? Shankar’s “teri bindiya re ” version is really nice, lata ji is also enjoying his singing. Hey dats a very nice piece of information about shankar mahadevan from your side, nand i seem to be more interested becausehe is my favourite music director, Looking forward for more posts from your side. i m very passionate about music.i live it.i drink it nd eat it.above all i worship it.it is my dream to give a stage show wid u.i knw dis a big demand bt u r d 1 who has promoted strugglers nd nwcomers nd nw they r reaching zenith.sir rite nw i m doing m.b.a frm pune nd u wud b singing here on 18th.bt due to my classes i m nt attending ur shw.as i m really missing it.i will soon send my voice on different music sites through net.jus gv me 2 minute frm ur precious time.sir i see dreams bt alongwid i stay on earth.so i jus want 2 sing wid u at front of thousands of audience 4 once.tht 1 day will b best day of life. wid respect of ur busy schedule..pls hav a look 2 my mail nd reply…….pls……..
Hello, I am a big fan of Mr Mahadevan. I wanted to know if you have an audio or video version of Shankar’s tere bindiya re. I have been searching for it, but youtube have deleted it and I haven’t had any luck elsewhere. I would really appreciate it, if you could let me know if you have it.